THE Halekulani is giving away four-night stays in its luxe Vera Wang suite for free, but put down the phone -- you're not eligible. Recipients will be the 125 presenters and performers at the 2006 Academy Awards on Sunday. They include Reese Witherspoon, George Clooney, Heath Ledger, Terrence Howard, Joaquin Phoenix and Felicity Huffman. Yes, the recipients could afford to pay their own freight but it's a public relations coup for the Halekulani -- at $25,000 per gift certificate. The Halekulani's contribution is the costliest item in this year's $100,000 Oscars gift basket. Nothing else comes close. 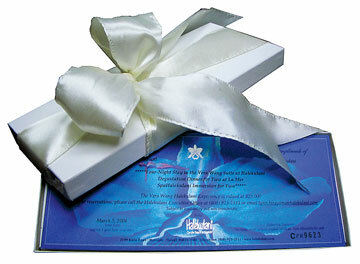 Some 125 presenters and performers at this Sunday's Academy Awards will receive a gift basket including this gift certificate for Waikiki's Halekulani hotel. Including a four-night stay at the hotel's Vera Wang suite, this piece of paper is worth $25,000. There are items such as $2,500 in spa services from the five-star, five-diamond Cornelia Day Resort in New York City; a $2,300, two-night stay at the Carlyle hotel, also in the Big Apple; a $1,500 private dinner party at Morton's, The Steakhouse; an Italian blanket valued at $1,500; a Tahitian pearl and diamond pendant from Tara & Sons Inc. valued at $1,300; a $600 Krups and Illy's coffee making ensemble; and so on. NOTHING in the gift ensemble is priced at less than $500, according to New York City publicist Kate Laufer, who counts Halekulani and the foregoing among her clientele. A local baby-wear designer is also said to have been chosen for the Oscar baskets, but the Academy Awards press office doesn't discuss or promote the baskets' contents. Ever. Item providers were restricted from discussing their contributions until yesterday. Halekulani has contributed to other awards shows' gift baskets but this is its first time at the Oscars. "Halekulani was approached by the Academy of Motion Pictures Arts and Sciences to formally present as the most valuable component of the Oscar Gift Bag," said Peter Shaindlin, chief operating officer of Halekulani Corp.
"We are thrilled to have been selected as the coveted Hawaii getaway for the presenters and recipients alike. Halekulani, a home away from home for celebrities and its globally acclaimed partnership with Vera Wang ... was recognized as a synergetic partner with the academy." The Halekulani certificates entitle the bearer to four nights in the Vera Wang suite, which starts at $4,000 a night and comes with 24-hour butler service and other private services and amenities; the $128 per person tasting menu at La Mer; and a signature treatment at SpaHalekulani. If one of the certificates pops up on eBay, don't even bother bidding. The numbered certificates are nontransferable, too, so the hotel will know who the bearers should be following the 78th annual glitterati gala. The Academy Awards countdown show, featuring arrivals, the dish on who's wearing whom and other folderol begins at 6 p.m. Sunday on KITV with the tape-delayed Oscars telecast to begin at 7.